As I have mentioned before we do not have a HDTV to plug the Raspberry Pi into, which is fine for RasMBC. RasMBC also has a decent display setup meaning I could centre and resize the screen to fill the entire TV, but the standard Raspbian does not and the LXPanel desktop window manager just fails if you try and setup the 'Monitor'. This means both the Desktop and the CLI boot tty is pretty unusable, with the prompt lost to the left hand side of the screen and no menu and hardly any buttons on the Desktop. A solution does exist, but I only found it after fixing my problem with Minecraft Pi. There are extras settings for Top,Bottom,Left and Right overscan. and I could have sworn that I had those number almost right, changed one parameter and then had to fiddle them all to get back to something sensible. Annoyingly each change required a reboot and to start up X11, which was a pain because the my USB mouse dies each time X11 starts, fix is to unplug and replug. I thought I would finally provide the Cory Doctorow book reviews I promised last year, mainly because the the pile of seven books seems to take over. The pile is only there to remind me to post the reviews, afterwards they go into storage ... ready for the next generation. I think this was the order I read them, not that its important, what is note worthy is I bought most of them for £0.01 (+P&P)from Amazon You can download all of them for free from his website in various ebook/etext formats. I actually read this on my phone on my daily commute, but also bought the paperback version, cannot remember in what order. Makers is all about reusing, initially technology that has been cast away and then 3D printers that can even print 3D printers. This subject is very close to my heart and I long to understand enough about electronics to be able to tip out the huge collection of odds and ends, motors and sensors, chips and wires I have accumulated over the last ten+ years. The story is well woven and highly readable I love the way it evolves from mucking about with electronics and sell the odd item on eBay to creating a movement that Disney want to get in one. This one is harder to summarise, there are virtual consciousnesses, rival gangs, murder(ish) and whuffie. whuffie became a recognised thing, but had died now. Not as good as some of his others, but still worth a read. This is amazing, there are mountains, a winged love interest, golems, washing machines, brothers who ingest each other and so much more. Oh and by the way they are the main characters, yes all of them, including the mountain and the washing machine. Yet somehow it all comes together into a highly readable adventure that you can not predict. This one is true cyber punk, there is technology coming out of everything, but yet there is heart humanity and a possibility of a terrible dystopian future. Aimed at young adults, this a thrill ride fun read. Not fiction, but a collection of essays regarding copyright and freedom of information. As mentioned previously this is a true *YOU MUST READ THIS BOOK* title, please for love of everything decent read this book and then get everyone on the planet to do the same. This is the most forgettable of the collection. I remember snippets, like the transfer of of songs when you drive by other vehicles and the economics that go with that, or the sanatorium roof. This book is really really well written, highly imaginative with lots of plot, story, characters and locations. I wonderfully blend of Asian and American cultures within cyberspace and out in the real world. From the prison type factories to the WOW grinders and gold farmers, to police brutality and gang warfare. I got Pirate Cinema from a Humble Bundle of ebooks and graphic novels. Not sure when I will read it. Currently trying to find time to read Flatland which was originally printed in 1884. I wanted to show my oldest that you could do programming on the Raspberry Pi and I know how much he loved playing Minecraft on the iPad. Not in survival mode but just creating his own house adding doors, paintings, bridges etc. Minecraft Pi is available for free download so I thought I would give it a whirl. After many hours of digging I hit on a tiny foot note at the bottom of a post about the screen being misaligned, which it was. So it is all because we do not have an HDTV!! Still, after disabling overscan I now cannot read the terminal prompt but Minecraft runs fine. 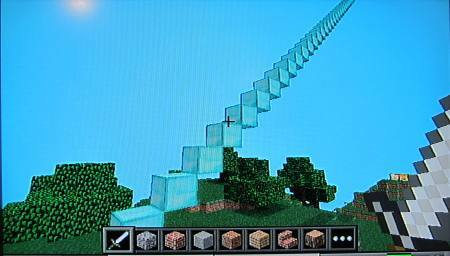 Next job, find out how to program in Minecraft ... go to http://pi.minecraft.net/ and follow the links "get started", "official site" and "dedicated wiki". But, alas no, those are generic links to the Raspberry Pi standard web pages, nothing about programming Minecraft. There are a few blog posts so I started with the headline catcher "Analog clock in Minecraft Pi". I expected a in game console window like in quake '~' anyone? but instead you run python scripts that "connect" to running Minecraft sessions. Being as this a low resolution non-HDMI setup this proved quite problematic, I could run Minecraft or a terminal window, not both, ALT+TAB did nothing. I did find a way of moving to the second desktop with ALT+TAB(nothing visual changed but then I could) CTRL+ALT+[Right arrow], this gave a me a clean desktop which I could run terminal. Now the trick was to run the python scripts and then switch back to desktop one to watch the fun, CTRL+ALT+[Left arrow]. After getting Hide and seek (hides a block and then tells you if you are warmer or colder trying to find it and finally the API demo which shows examples of most type of commands, add, delete, change, move, wait, print etc. In the end we opted for a simple staircase routine, move forward, move up, add brick, rinse repeat, instant staircase reaching for the sky. FYI I tried scrot and import to take the above screenshot but both returned black rectangle where Minecraft was. I had heard some bad stories about ordering cheap USB devices from China on eBay but for £4 inc P&P I would take the risk. Plugged it in and using dmesg found the id of the device New USB device found, idVendor=0c45, idProduct=7401 which I could then Google on. http://bitplane.net/2012/01/temper1-ubuntu/ as it seemed to be the simplest requiring no dependencies. And there is a handy continuous logging script. (tee echos the output and also saves it to a file, 'T' for T-Junction). 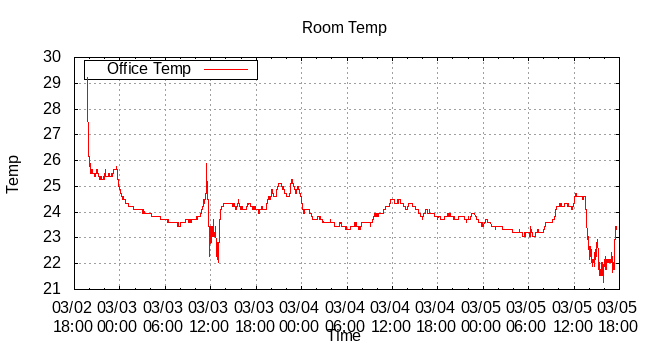 Strange thing was the temperatures being recorded seemed rather high, normally 8-10 degrees more than I expected (gauging from the central heating panel in the hall). This went on for a couple of days, was the USB gadget faulty, or even fake ? No, the Raspberry Pi was running about 10 degrees hotter than the ambient temperature and the USB temperature logger was acting like a heat sink! Unplugged it, added a short USB cable (30cm) and the logged temperatures are back to what I expect and the logger is cool to the touch. So how to view all this temperature data ? One of the previous temperature logging drivers/apps had a detailed explanation of using the csv data to power a GNUPlot graph. GNUPlot is designed to be the single point of focus for any kind of graph you can imagine, from basic line, bar and scatter to 3D, recursive and Fractal 3D. This in turn means that it is not the easiest of things to start with. After numerous attempts I finally created a .GP script that works with the files created earlier.